From Myrna Bilton, president, ISA, and past president, CNSA. I’m delighted to receive a picture from friends from my community…..Belwood, Ontario, Canada. 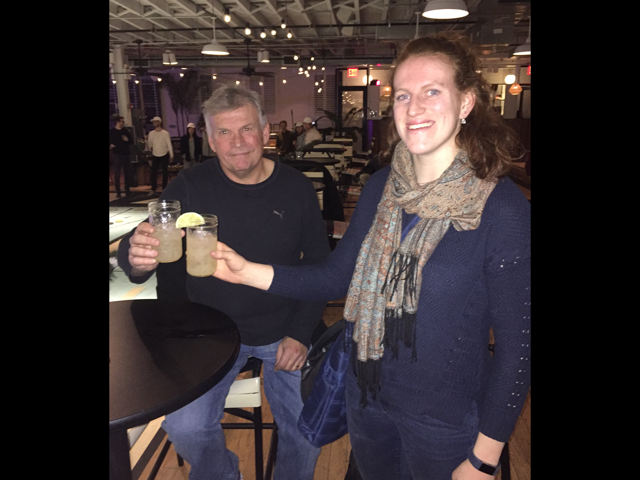 Steve Shaw and his daughter Stephanie Shaw are in Brooklyn, NY visiting the The Royal Palms Shuffleboard Club. They are enjoying the “Myrna Bilton” drink. On behalf of the CNSA membership, we send our deepest condolences, to our Quebec Director Louisette Martel Tanguay and her family. Rene Tanguay has passed. Our thoughts and prayer are with them. It is with great sadness I have to inform you of the passing of Vivian Ball. I am not sure how many of our Canadian shuffleboard players knew Vivian, but I am sure most of us know her husband Earl. Our thoughts and prayers go out to Earl and the Ball family. Jim Corbeil President Canadian National Shuffleboard Association. Webmaster’s Note: We have seen Earl in ISA tournaments and also in Ontario tournaments teamed up with our own Henry Strong. Earl Ball plays out of the Betmar club in Florida. Over two years ago when I was elected President I wanted to make the CNSA a true Canadian Association. I asked Don Breau, from New Brunswick, Myrna Bilton, from Ontario, Brian Scott, from Alberta, and myself to draft a new set of CNSA By-laws. We worked very hard on this with the advice of a lawyer. The new bylaws were to have every Province involved in the running of the CNSA and each Province would have at least one Director. The proposed By-laws were on the website for five months before they were voted on. Everyone had a long time to ask questions or give an opinion. (which they did) The Revised By-laws were then voted on and passed unanimously, July 2017, at the IP in Moose Jaw Saskatchewan. Now that we have the New Board of Directors in place, the Chairman, wants to revise the By-laws. (once again) The Board of Directors have been in place only three and one-half months. WHY would we want to change By-laws or anything else for that matter without even giving this a chance to work? idea, of By-law change, and get on with making the CNSA a truly Canadian Association. James Corbeil, President Canadian National Shuffleboard Association.